Traditionally, cowboy boots provided functional protection against the rough lifestyle of horseback riding and cattle herding. During the 1920s, western films and radio programs influenced popular culture and soon cowboy attire, especially footwear, was introduced into the repertoire of contemporary fashion. You don't have to live in the southwest to sport a nice pair of cowboy boots. You don't have to have the granite-hard attitude of John Wayne or the mischievous nature of Daisy Duke, but to pull off the cowboy boot, you have to be able to choose the right pair for you. First, you have to know how you will be using your boots. Traditional boots are still used for doing work, riding horses, and the like, while fashion boots are not crafted to endure these sorts of abuses. Regardless of use, be sure that your boots are made with quality in mind. There are a few key features you should look for when choosing your boots. Leather heels should be used rather than a thin leather laminate. A stiff leather piece should be stitched behind the heel for support. The leather should be smooth and supple with no deep pit marks. The boots should have straight, even stitching with no loose ends, and the toe should be stiff and uniform, with no bulges. 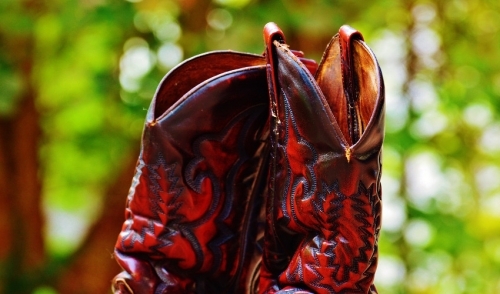 Remember, contemporary cowboy boots may be produced with artificial leathers and other materials. Genuine leather may cost more, but it will last longer and “breathe” better, allowing more comfort for the wearer. The shank is the sleeve of the boot that extends up the leg. Shanks can vary form ankle to knee height. Shank height is a matter of personal choice, but more shank leaves more room for flourishes in design, especially on fashion boots. Material choice is an important variable to be considered when choosing a boot, and may be partially determined by budget; More exotic leathers may be costly. However, each leather has its own character and you should choose a leather on the basis of appearance, comfort, and function. For instance, cowhide is an excellent choice for an everyday working boot, but may not possess the sheen or detail for going out to a party or formal occasions. Suede is form-fitting and is a good material for extensive walking. Alligator and ostrich leathers are very durable and can be worn in variable terrains as well as for fashion purposes due to their textured appearance. Toe shape is the finishing touch to the appearance of your new boots and is important to how they fit your feet. A pointed or snip toe gives a “fancy” appearance, but can be uncomfortable for people with wide feet. In this case, the more burly square or round toe may be better choices. Regardless of your boot choice, be sure to try on a few pairs of boots and see which style and material fits both your feet and lifestyle.